Brooke's first introduction to Star Wars was the result of what was once considered a rite of passage for most children; chickenpox. "I was in the sixth grade and was home sick with the chicken pox with nothing to do but try not to scratch and watch movies," says Brooke. She had just about watched their entire movie collection when her mother found a recorded-from-TV copy of "The Empire Strikes Back." She let Brooke watch that and she loved it, but she wanted to see more and learn what happens, so her mom went out and rented the other two movies. "Yeah, I did see them out of order, but I was still hooked," says Brooke. She has loved Star Wars ever since. She made it to Celebration I and by the time Celebration II came around, she was already into Star Wars costuming. Brooke says "it was there that I was introduced to the 501st Legion and I instantly knew that I wanted to own armor and join up." 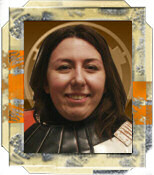 Brooke has trooped over 60 events since joining the Legion in April of 2005. When asked if she has a favorite, she says "it would probably be the John Williams Tribute Concert in Toledo, OH. We were asked to help participate on stage. I and another trooper marched out on stage before Darth Vader came out. We stood on either side of the conductor. When Darth Vader came out, he force-choked the conductor and then started conducting the orchestra himself! When the conductor tried to come back, we troopers turned and focused our blasters at him. It was so much fun and the crowd really enjoyed it." Back in 2006, "Thumper," as Brooke is known on the Garrison forum, got her nickname while at the Motor City Comic Con. "I had just gotten a new tattoo on my lower back of the imperial cog. I spent most of the after-party showing off my new ink. Roger (TD-0866) is the one who actually coined my nickname, by calling me Thumper that evening. And the name has stuck ever since," says Brooke. The 501st Legion has changed her life for the better as she has met her fianc� Jason (TA-1703) and many wonderful lifelong friends through the 501st. Outside of the Legion, Brooke is a 3-D computer artist, specializing in computer generated imagery production, design, and visual communications. She has a Bachelors of Fine Arts degree and her other interests include scrapbooking and photography, and cherishes time with her little rescued Sheltie, Abby.